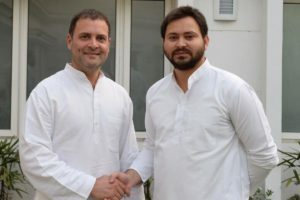 Rashtriya Janata Dal (RJD) leader Tejashwi Yadav has said that Congress President Rahul Gandhi has all the required qualities to become a good Prime Minister. While Yadav did say that Gandhi would make for a good PM, he also said that the issue of who will be the PM can be settled after the 2019 polls by the grand alliance collectively. Yadav also alleged that Bharatiya Janata Party’s (BJP) propaganda machinery spent hundreds of thousands of crores to malign Gandhi’s image.